2 Position as yesterday. Enemy artillery action 3 o.r.s. “Killed in action.” 6 o.r.s. wounded. 1 o.r. admitted to hospital. 2 o.r.s. returned from hospital. Lieut. W.K. FRASER admitted to hospital (sick). Lieuts. W.H. WILLARD, W.O. BROWN, W.F. HUYCKE arrived as reinforcements. 3 Position as yesterday. 1 o.r. 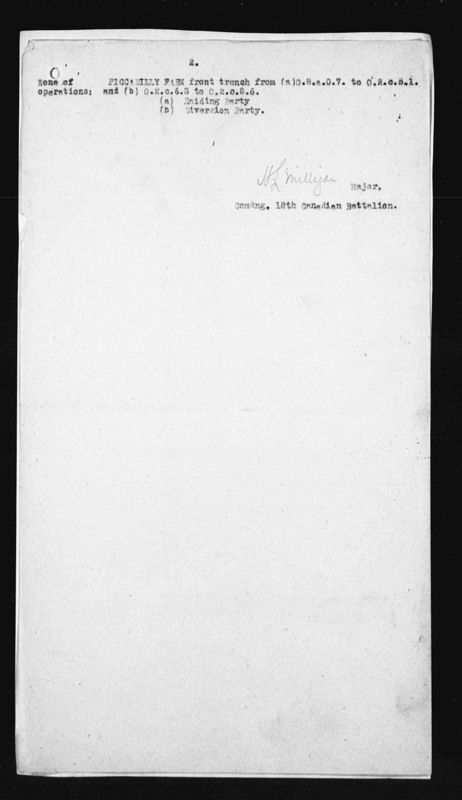 “Killed in Action”, 2 o.r.s. sick, 1 o.r. admitted to hospital. 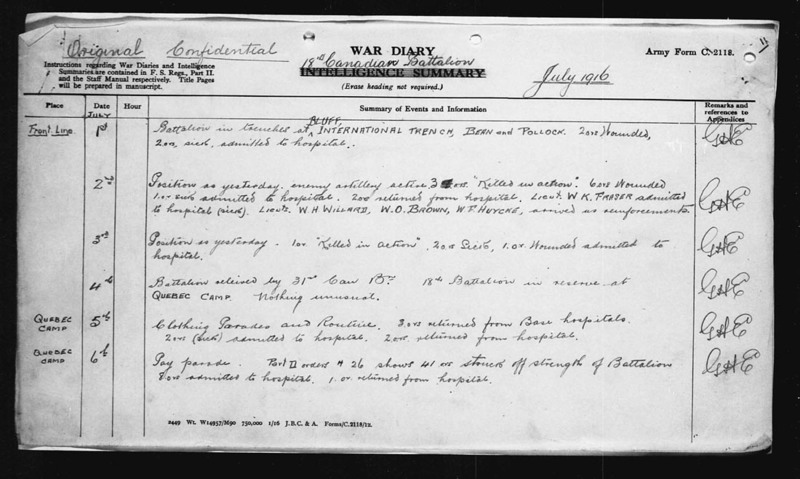 4 Battalion relieved by 31st Can. Bn. 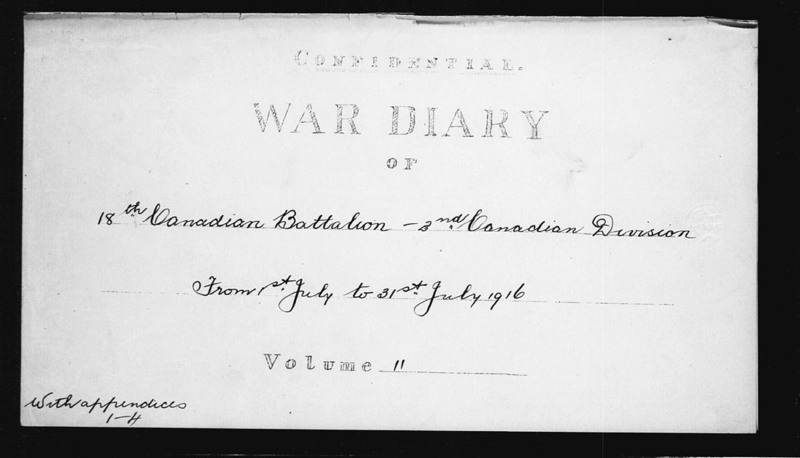 18th Battalion in reserve at QUEBEC CAMP. Nothing unusual. QUEBEC CAMP 5 Clothing Parades and Routine. 3 o.r.s. returned from base hospitals. 2 o.r.s. (sick) admitted to hospital. 2 o.r.s. returned from hospital. QUEBEC CAMP 6 Pay Parade. Part II orders #26 shows 41 o.r.s. 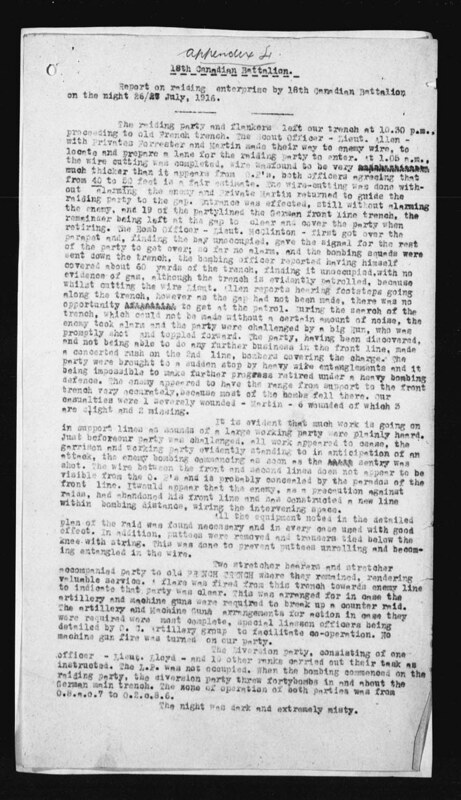 struck off strength of Battalion. 8 o.r.s. admitted to hospital. 1 o.r. returned from hospital. QUEBEC CAMP 8 Routine. 2 o.r.s. sick admitted to hospital. Lieuts P.C. PEPPIATT and J.C. [J.M.] CHISHOLM arrived as reinforcements. QUEBEC CAMP 9 Church parade 10 am. 1 o.r. reported “Died of Wounds” 6-7-16 C.C.S. 2 o.r.s. admitted to hospital. 1 o.r. returned from hospital. Lieut. A.P. ROSS arrived as reinforcement. 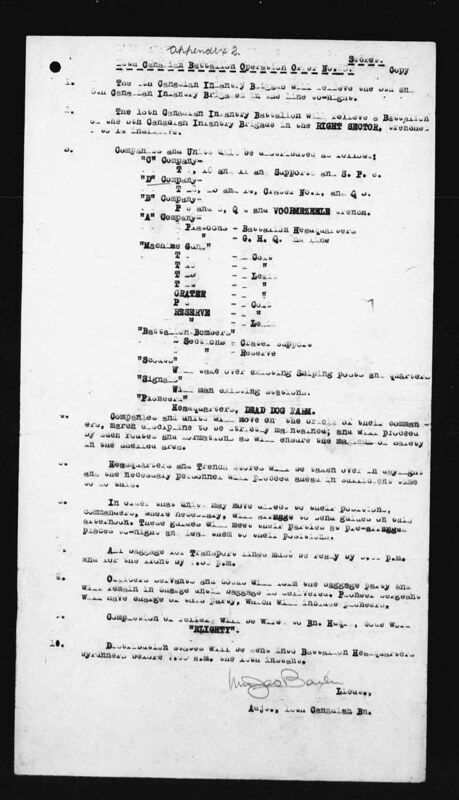 QUEBEC CAMP 10 Parades as per syllabus attached. 3 o.r.s. admitted to hospital. 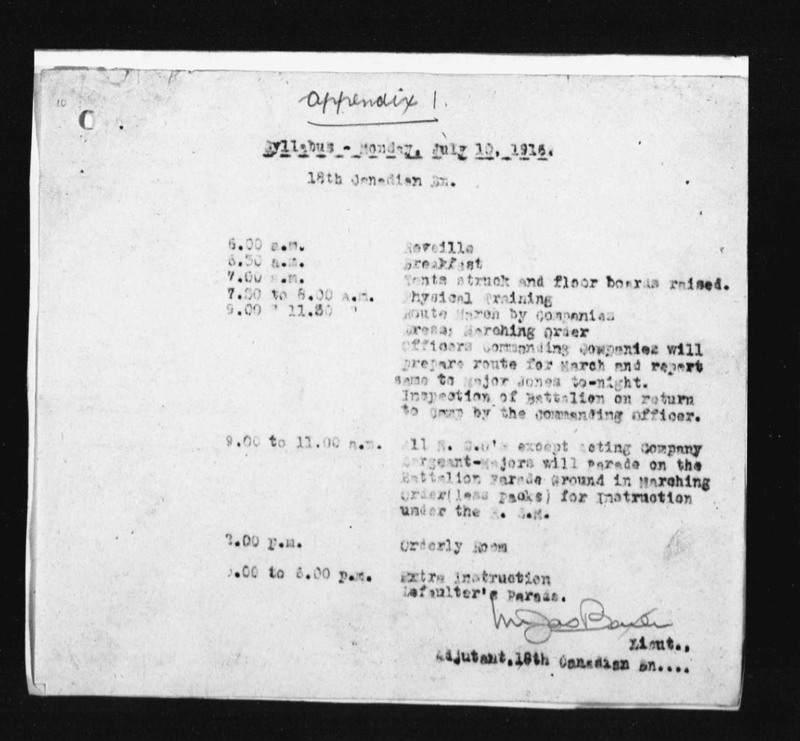 QUEBEC CAMP 11 Parades as per syllabus attached. Battalion as gas demonstration 2.30 pm. CAPT. T.C. LAMB admitted to hospital. 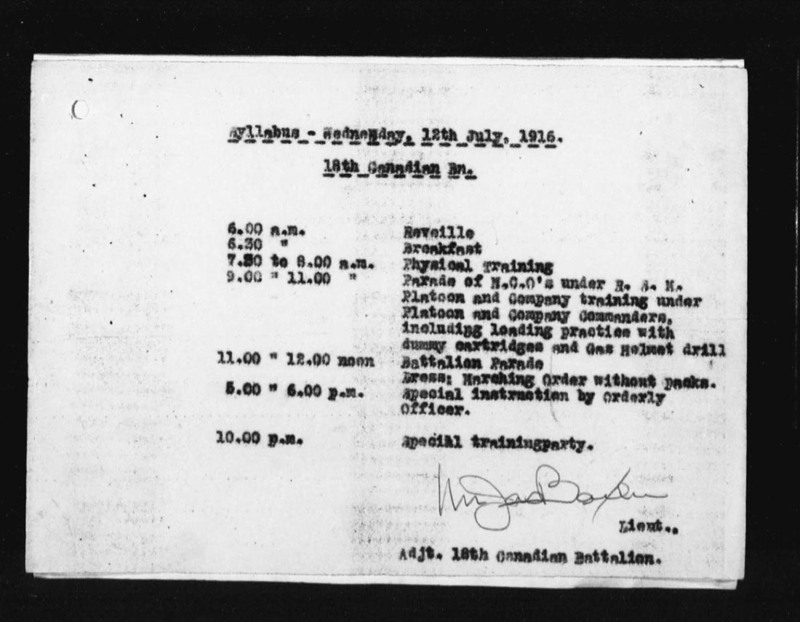 Part II orders shows 24 o.r.s, 1 officer struck of strength of Battalion. QUEBEC CAMP 13 Parades as per syllabus attached. 100 o.r.s. arrived as reinforcements. 3 o.r.s. admitted to hospital. 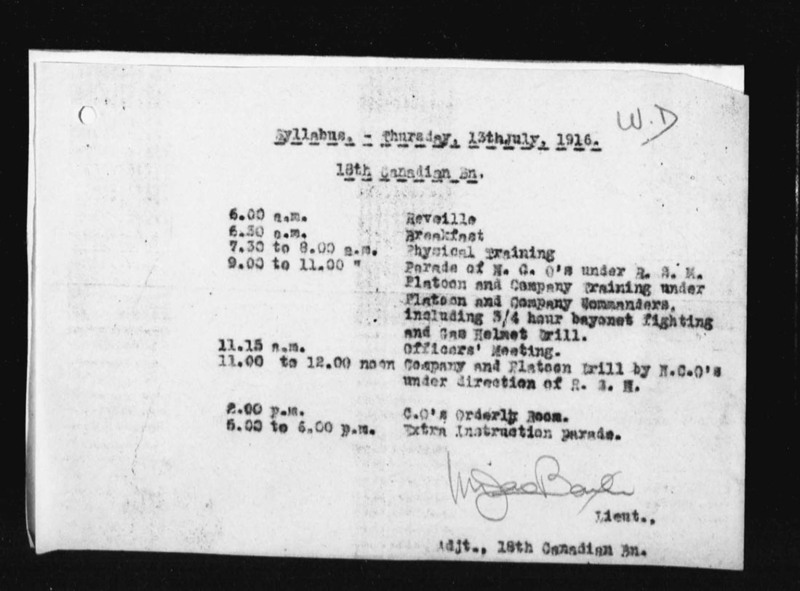 QUEBEC CAMP 14 Battalion parade for Pay. LIEUTs. E.R.V. LLYOD and H.D. DUNNETT proceeded on leave. CAPT. C.H. EMERY takes over duties of paymaster. 2 o.r.s. admitted to hospital. 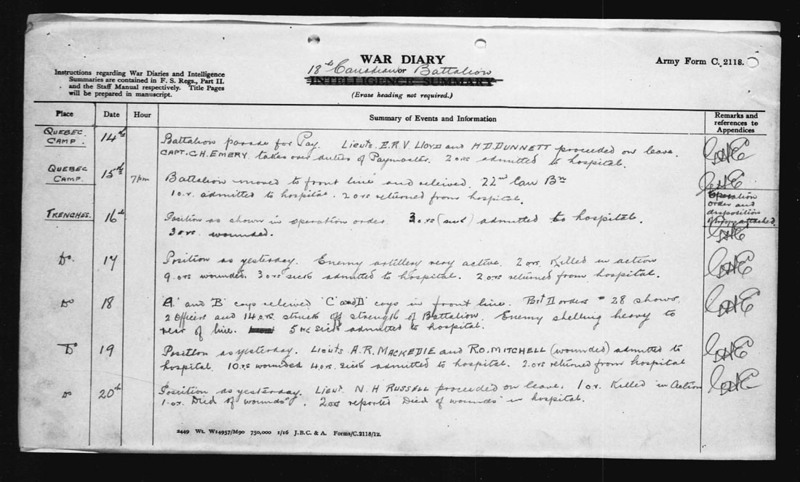 QUEBEC CAMP 15 7 pm Battalion moved to front line and relieved 22nd Can. Bn. 1 o.r. admitted to hospital. 2 o.r.s. returned from hospital. 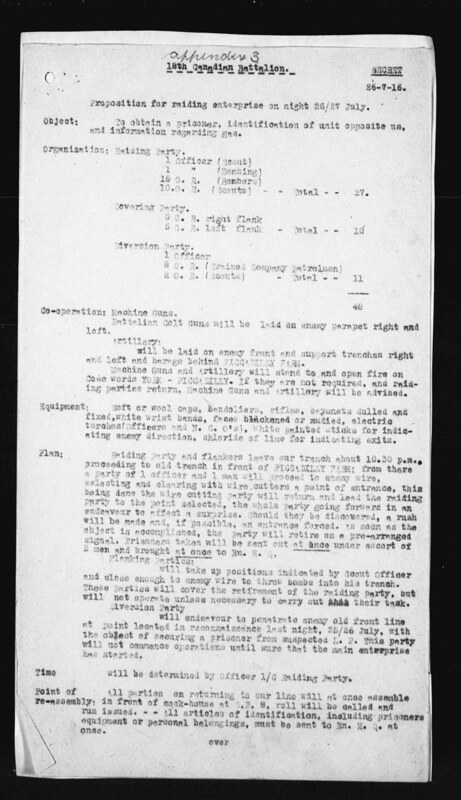 TRENCHES 16 Position as shown in operation orders. 3 o.r.s. (sick) admitted to hospital. 3 o.r.s. wounded. TRENCHES 17 Position as yesterday. Enemy artillery very active. 2 o.r.s. killed in Action. 9 o.r.s. wounded. 3 o.r.s. sick admitted to hospital. 2 o.r.s. returned from hospital. TRENCHES 19 Position as yesterday. LIEUTS. A.R. MACKEDIE and R.O. MITCHELL (wounded) admitted to hospital. 10 o.r.s. wounded. 4 o.r.s. sick admitted to hospital. 2 o.r.s. returned from hospital. TRENCHES 20 Position as yesterday. LIEUT. 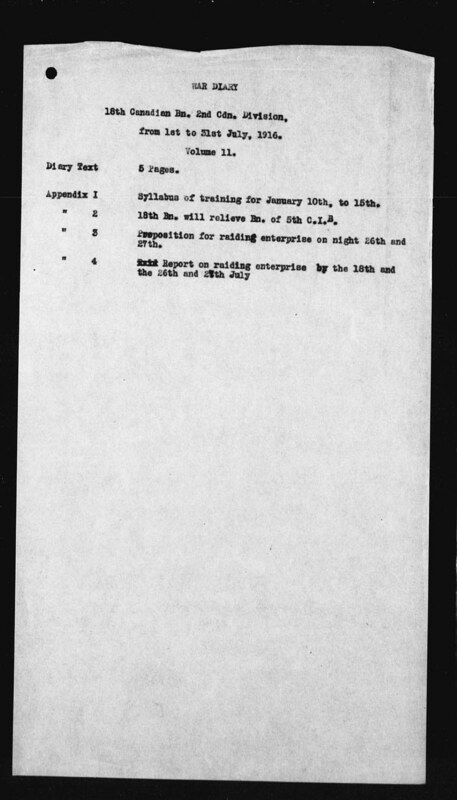 N.H. RUSSELL proceeded on leave. 1 o.r. Killed in Action. 1 o.r. Died of Wounds. 2 o.r.s. reported Died of Wounds in hospital. TRENCHES 21 Position quiet. LIEUT. J.C. CULLEN returned from hospital. 1 o.r. Killed in Action. 1 o.r. wounded. 3 o.r.s. sick admitted to hospital. TRENCHES 22 Position as yesterday. Nothing unusual. Enemy artillery action. 5 o.r.s. wounded. 2 o.r.s. sick admitted to hospital, 4 o.r.s. returned from hospital. C and D coys relieved A and B coys front line. TRENCHES 23 Position as yesterday. 1 o.r. reported “Died of Wounds” #10 C.C.S. 20-7-16. 1 o.r. killed in action. LIEUT. W.H. WILLARD and 3 o.r.s. wounded and admitted to hospital. 49 o.r.s. arrived as reinforcements. LIEUTS. E.R.V. LLYOD and H.D. DUNNETT returned from leave. TRENCHES 24 Position as yesterday. Part II orders #29 shows 17 o.r.s. struck off strength of Battalion. 8 o.r.s. sick. 2 o.r.s. wounded, admitted to hospital. 3 o.r.s. returned from hospital. TRENCHES 25 Position as yesterday. 4 o.r.s. admitted to hospital. 1 o.r. returned from hospital. 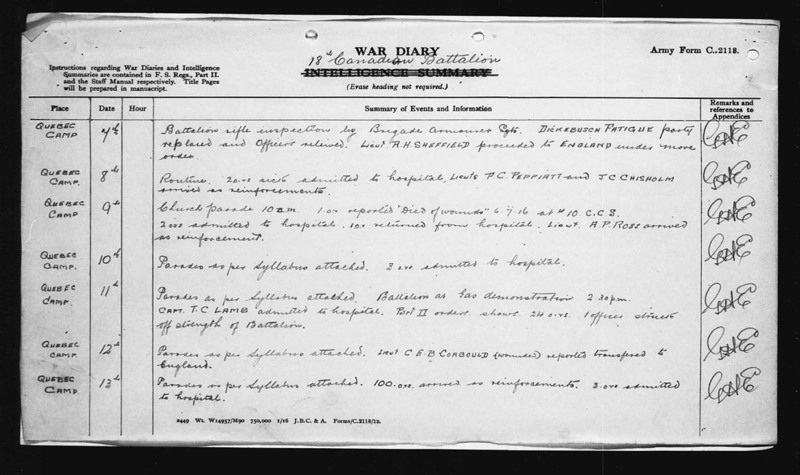 Reconnaissance of Enemy wire made by patrol in view of a raid. TRENCHES 26 10.30 pm Position as yesterday. 2 o.r.s. sick 6 o.r.s. 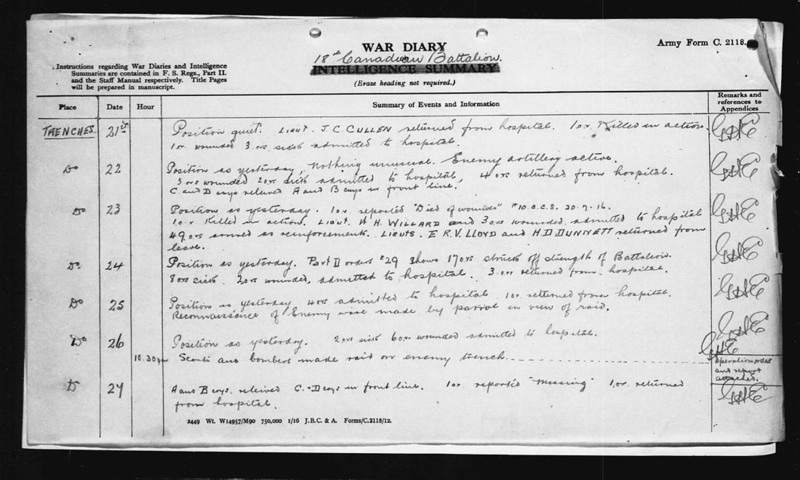 wounded admitted to hospital.Scouts and bombers made raid on enemy trench. TRENCHES 27 A and B Coys relieved C and D Coys in front line. 1 o.r. reported “missing”, 1 o.r. returned from hospital. TRENCHES 28 Position as shown yesterday. LIEUT. 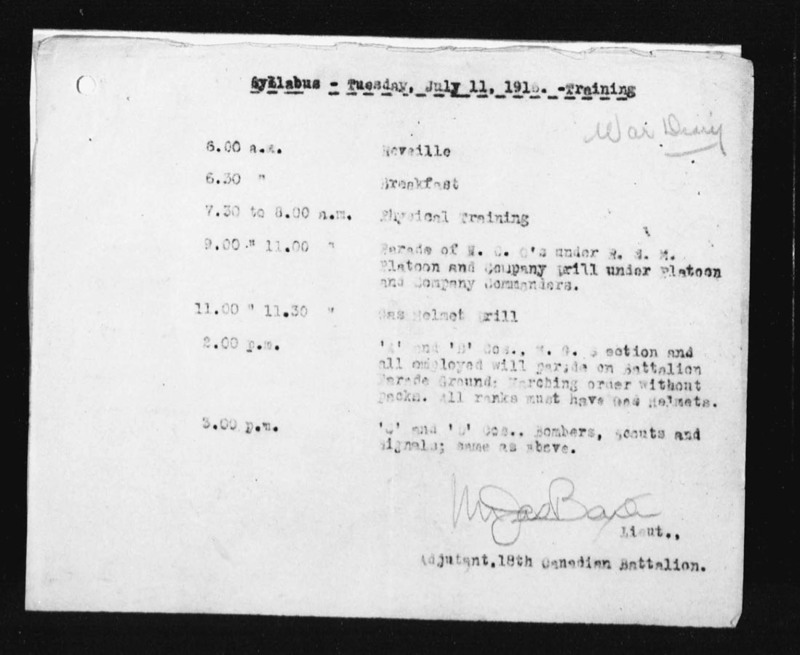 W.K FRASER returned from hospital. 1 o.r. admitted to hospital. TRENCHES 29 Position quiet. SGT. T RAYWARD appointed Temp. 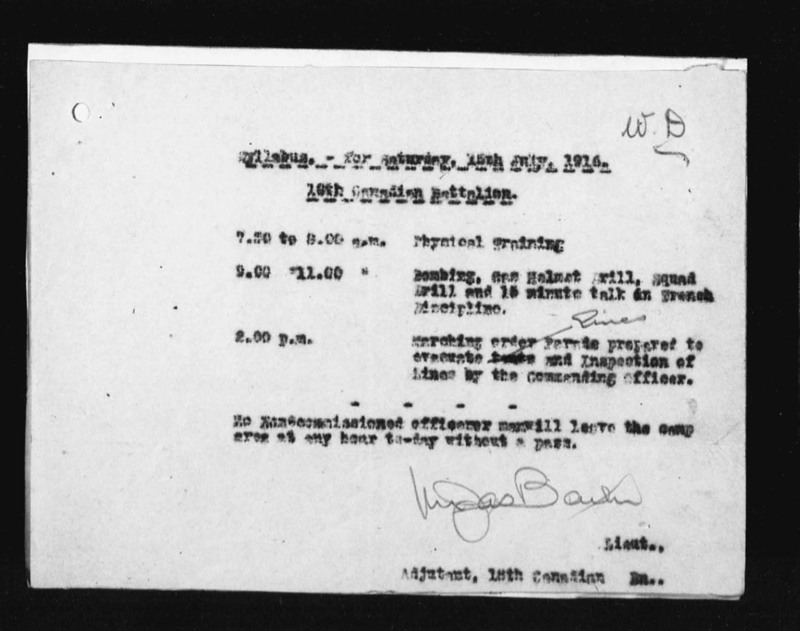 Lieut and posted to ‘D’ Coy. 2 o.r.s. wounded. TRENCHES 30 Position as yesterday. 30 o.r.s. arrived as reinforcements. 2 o.r.s. admitted to hospital. 1 o.r. returned from hospital. 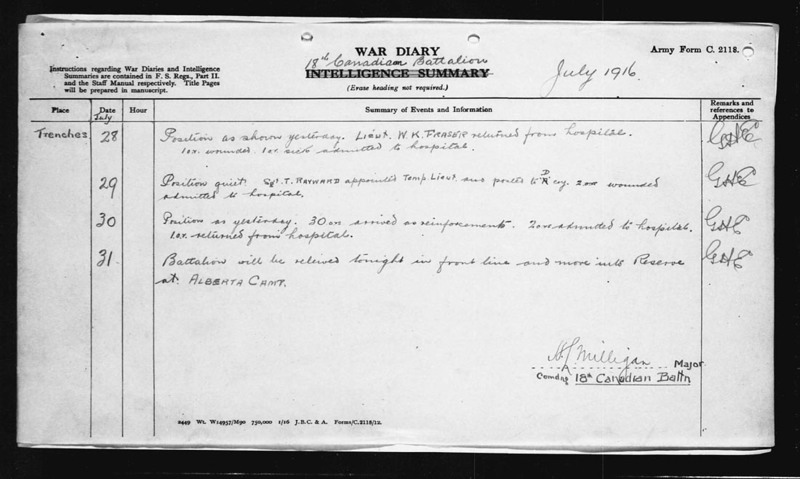 TRENCHES 31 Battalion will be relieved tonight in front line and move units Reserve at ALBERTA CAMP.